Going to Lijiang from Dali now costs only half. Travel time from Kunming to Lijiang was also cut from 18 hours to 9, while travel cost was reduced from CNY240 per trip to CNY75. Photo credit: ADB. Effective project design and community engagement helped the Peoples' Republic of China overcome the challenges in building the Dali-Lijiang Railway. The poor, remote northwestern region of Yunnan province in the People’s Republic of China (PRC) was cut off from mainstream development because of lack of transport connectivity. In 2004, the Asian Development Bank (ADB) approved the Project which built a167-kilometer rail line to connect the historic cities of Dali and Lijiang. The project overcame complex geological and environmental challenges through informed decisions on rail alignment and design and careful consideration of affected ethnic minority groups. The project provided the shortest land route between the two cities and connected them with other major cities and ports, as well as to the Greater Mekong Subregion. The railway also helped increase tourism revenues and create jobs. This was adapted from a case study in Lessons from ADB Transport Projects: Moving Goods, Connecting People, and Disseminating Knowledge. Mountainous terrain that includes fragile, protected areas of environmental and historical significance impeded access to the northwestern region of Yunnan. The limited road network, poor road condition, and high transport costs all contributed to the lack of connectivity, particularly between the key cities of Dali and Lijiang. The tourism industry was constrained and development moved at a snail’s pace. Northwestern Yunnan needed better transport connectivity to boost economic growth in the region. Yunnan is endowed with rich natural resources, cultural diversity, and picturesque tourist destinations. The historic cities of Dali and Lijiang in the northwestern region offer several tourist destinations to domestic and international travelers. Dali City is home to the Cangshan and Erhai National Nature Reserves, which encompass the Cang Mountain, Erhai Lake, Three Pagodas, Snake Bone Tower, Butterfly Spring, Gantong Temple, ancient Dali town, and the Bai Folk House Complex. Further up north, Lijiang City features the Yulong Snow Mountain, Lugu Lake, Laojun Mountain, and the old Lijiang town, which was declared a UNESCO world cultural heritage site. These sites lie against a background of alpine ice and snow, plateau meadows, and primitive forests. Northwestern Yunnan, a landlocked, remote, and poor area, is among the least developed in the PRC. Of the 1.1 million potential beneficiaries, about 75% were rural and 30% were poor. About 73% were ethnic minorities: Bai (46.2%), Naxi (18.3%), Yi (3.2%), and Lisu (2.8%). Two major factors hindered economic growth: lack of connectivity and high transport costs. The area’s road network was limited and in poor condition. Bus travel from the provincial capital Kunming to Lijiang took about 8 hours and cost 180-240 Chinese yuan (CNY) per trip. To get to Dali from Lijiang, travelling by land for 4 hours, which cost CNY60-CNY70 per trip, was the only option. For freight, the road tariff was CNY0.65 per ton-kilometer. The Dali-Lijiang Railway Project was initiated in 2004 to improve access to the remote, underserved, and poor northwestern region of Yunnan. The West Yunnan Railway Company constructed a 167-kilometer railway that connected Dali to Lijiang. There were several challenges to building a railway in this remote area. The difficult terrain and the cultural heritage and tourist spots in the project site were major factors to consider. The railway had to be designed to adjust to the topography without marring the tourist spots and further harming the soil and slopes that were already prone to erosion. Another factor was the high number of ethnic minorities in the project area, including the boundary of impact. Their unique and diverse customs and cultural traditions made the project area a major tourist destination. The project design entailed extensive consultations and careful consideration of the concerns of ethnic minorities. Although the project would help ethnic minorities gain access to more markets and services, the West Yunnan Railway Company had to ensure it would not adversely affect their cultural values and socioeconomic systems. Their cultural identity may be undermined by the influx of travelers and businesses. The impact assessment and agreed actions were included in the Ethnic Minorities Development Plan endorsed by the Ministry of Railways and the West Yunnan Railway Company. Several key measures ensured the technical soundness of the railway’s design while minimizing its social and environmental impacts. Design rail alignment for local conditions. The project site sits amid the Yunnan-Guizhou plateau and Hengduan mountains, which has elevations ranging from 1,900 meters to 2,300 meters. These mountains, rising from east to west and from south to north, huddle over two major river systems with corresponding tributaries. The riverbeds are deep and the slopes surrounding them are steep. Erhai Lake, which lies atop a geological fault, is also situated within the project area. Finding a suitable railway alignment was a major challenge for the project. Three rail alignment options were explored. The first option was for the railway to go through the mountains west of Dali, passing through its scenic spots. The second option was for the railway to run parallel to the Dali Highway, passing through the cultural and heritage areas. The third option was for the railway to be built along the east side of Erhai Lake, which will not impact key tourist areas and large populations. This third option was chosen since it offered minimal impact to the environment, cultural sites, and residents. There were fewer mountains to go through, less farmland to be acquired, and fewer businesses to relocate. Designing the railway to suit the rail alignment posed another challenge. Although the chosen alignment offered the least environmental disturbances, the rail line would pass through rivers, watershed areas, and mountains. The project completed 11.4 million cubic meters of earthwork and rockwork to make a 70.8-kilometer roadbed for the main line. Construction of the roadbed entailed deep cutting in 34 sites. Five steep embankments with heights over 20 meters and 77 bridges with a total length of about 26.253 kilometers were also built. The project also had to burrow through mountains to create 45 tunnels with a total length of 78.6 kilometers. The bridges comprised 15.7% and the tunnels made up 41.9% of the total railway length. Almost half of the project area sits on severe soil erosion regions. As the project entailed deep excavations and construction works, vegetation would be affected, which would contribute to further soil erosion. The project used several measures to minimize loss of soil. It optimized design and regulated earthwork to enhance the rail’s horizontal section line, thereby reducing the amount of excavation and spoils. Each completed construction segment or earthwork was immediately followed by filling and revegetation. The slopes of the roadbed were safeguarded using a variety of protection measures, namely mortar rubble slope protection, dry-laid rubble slope protection, and vegetation slope protection. Retaining walls were also established. These measures reduced the volume of soil loss caused by the construction of the roadbed, stations, and yards to 31,200 tons per annum, for a total of 93,600 tons over the construction period. Support cultural preservation and tourism development. The project supported cultural preservation and tourism development in two ways. Technical assistance was provided in training locals in cultural preservation and its integration with tourism development and the ethnic minorities development plan, which specified actions, including the incorporation of tourist facilities into rail operation design. The technical assistance package enabled local government officials, local artists, academics, and village residents to exchange ideas on practical strategies that they can use to harmonize cultural preservation with tourism development. Lessons from these seminars were eventually applied to five pilot activities in different areas within the project area. The seminars and pilot activities ensured that the entry of more tourists in the area would not overwhelm or adversely impact the cultures and traditions of local ethnic groups. To facilitate the entry of more visitors, the project included tourist coaches into its railway operation. Consult stakeholders and promote project ownership. Extensive consultations among more than 4,000 stakeholders, including ethnic minorities, were conducted to help understand public perception of the railway, inform environmental and social assessments, and prepare the resettlement plan and an Ethnic Minorities Development Plan. The consultations showed that there was widespread support for the project in general and people were looking forward to the benefits and opportunities opened by the project. The consultations also ensured people’s participation in and ownership of the project. Build access roads to connect to the railway. One important value addition to the project that expanded the its benefits to more people in the province is how it went beyond the rails to reach out to northwestern Yunnan’s interior areas. About 139 kilometers of access roads were constructed to connect the railway stations to the nearest counties or townships. 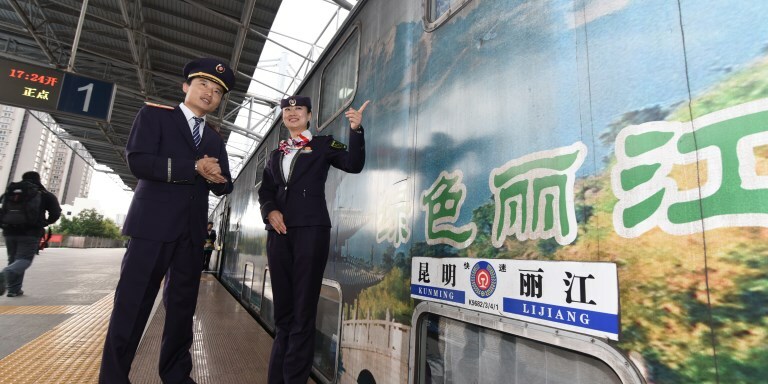 The Dali-Lijiang Railway Project has provided many benefits to stakeholders, such as connectivity, increased incomes, tourist volumes, and a livelier local economy. The railway has connected the northwestern part of Yunnan to the provincial capital Kunming and to major cities, such as Shanghai and Beijing, by linking with the national rail corridors. The capacity of its passenger trains ranges from 980 to 1,190 per trip. At the beginning, only 28.8% of train capacity was filled. After 12 months, passenger numbers increased to 92% of capacity, equivalent to about 1,305,000 passengers. The project has drastically reduced travel time and cost. Going to Lijiang from Dali now costs only half, while travel time from Kunming to Lijiang was cut from 18 hours to 9, and travel cost was reduced from CNY240 per trip to CNY75. This railway is also part of efforts to enhance regional cooperation in the Greater Mekong Subregion. It connects to the Pan-Asian railway as well as the port of Hai Phong in Viet Nam. The most recent validation report for the project rated its socioeconomic impact as significant, as it has contributed to lowering the cost of living in Lijiang. It also made available a wide range of products, compared with 2004. Prices of goods also decreased and were only slightly higher than those in Kunming. The railway has not compromised local culture in northwestern Yunnan. The accelerated growth and tourism had started before the project and did pose serious risks. The implementation of the Ethnic Minorities Development Plan contributed to greater awareness of these risks and the need to preserve and develop cultural heritage. The pilot cultural preservation projects, initiated by the project’s technical assistance package, showed that cultural preservation can be successfully integrated into local economic development, and can also be a focal point for tourism. The project demonstrates how the railway supported the local tourism industry, enabling it to increase earnings by providing tourists a more convenient option to visit the province. The Dali-Lijiang Railway Project offers lessons that could help inform other railway projects. The West Yunnan Railway Company has already successfully applied the following key lessons in its subsequent railway project designs. Improve connectivity and promote regional integration. By considering the conditions surrounding this project’s railway alignment and the livelihood and trade of the affected population, the project chose an option that will not only cause minimal harm to the environment and residents but also capitalize on and bolster local industries. The alignment of the railway did not only open markets and services, it helped promote tourism in the province, which was a pillar of Yunnan’s economy. Optimize design, construction, and operation. The project made the railway stations accessible to remote towns through the construction of 139 kilometers of access roads. The Ethnic Minorities Development Plan prepared residents for the influx of tourists brought about by increased connectivity and incorporated tourism facilities into the project design, such as tourist coaches. Thus, the railway, aside from providing a less-expensive passenger and freight transport option, became an integral part of a thriving local economy that provides additional income to the province. The project is situated in a mountainous area with abundant flowing rivers and historical, cultural, and tourism sites along its route. Underneath this picturesque scene is soil prone to erosion. The project had to make adjustments, not just with alignment, but with the design of the railway. Transport projects do not only need to adjust to the environment, but they need to include, as the project validation report recommended, a continuous process of adaptation to the latest construction and operation technology and more environment-friendly solutions. Forecasts on cost and traffic should be realistic. Transport projects may experience delays and setbacks if it fails to realistically estimate what needs to be done and the corresponding costs. Construction works should be planned and agreed on at the onset, and should have contingencies on possible price variations. This project experienced delays in loan closing primarily because of negotiations on pricing for additional works or variations. In addition to meticulous cost and works estimation, traffic forecasts must be carefully and realistically made as this has implications on project impact and outcome. The project’s traffic forecasts were deemed overly optimistic by the validation report; it failed to consider the rural or greenfield nature of the site, which would necessitate efforts to attract bus and private vehicle users to use the rail. The extensive consultation during planning, design, and construction helped promote people’s ownership and responsibility for the project. Dialogue and consultation meetings were done to inform design, construction, safeguards, job opportunities, ethnic minority culture protection, gender, and social impacts. These consultations made the design relevant, the whole project more sustainable, and allowed stakeholders to have a real voice in the proposed infrastructure, which eventually facilitated their ownership of the project. Ownership is important, as this case illustrates, since it can ensure commitment to project implementation and eventually operation, even when confronted with difficulties. More importantly, the stakeholders’ ownership of the project ensured that it was well integrated with not just the terrain, but with the affected people's way of life and livelihood. Asian Development Bank (ADB). People's Republic of China: Dali-Lijiang Railway Project. ADB. People's Republic of China: Dali-Lijiang Railway Project (Yunnan Province). ADB. 2017. Lessons from ADB Transport Projects: Moving Goods, Connecting People, and Disseminating Knowledge. Manila. ADB. 2016. Railway Brings Trade, Tourism, and Development to Yunnan. ADB. 2014. Validation Report. The Dali-Lijiang Railway Project. Manila. ADB. 2013. Completion Report: Dali-Lijiang Railway Project. Mandaluyong. ADB. 2008. Technical Assistance Consultant’s Report. Support to Ethnic Minorities’ Development Plan. The Dali-Lijiang Railway Project. Manila. ADB. 2005. Dali-Lijiang Railway Project Ethnic Minorities Development Plan. Mandaluyong. ADB. 2004. Report and Recommendation of the President to the Board of Directors: Proposed Loan to the Peoples’ Republic of Chinafor the Dali-Lijiang Railway Project. Manila. ADB. 2004. Summary Environmental Impact Assessment. The Dali-Lijiang Railway Project. Manila. ADB. 2003. Technical Assistance to the People’s Republic of China for Preparing the Dali-Lijiang Railway Project. Manila. Tyrrell Duncan has over 30 years of experience in international development. As technical advisor of ADB’s Transport Sector Group, he previously led the bank’s work on transport, which accounts for about a third of ADB lending. Previously he was transport director for East Asia, and bank-wide practice leader responsible for formulating ADB’s sector strategy for transport, the Sustainable Transport Initiative. He has degrees in economics and public policy. Ki-Joon Kim has over 30 years of professional experience and academic research in the transport sector in Korea and the United Kingdom He has worked with public and private institutions on various transport and urban transport projects. Since he joined ADB in 2010, he has been working on sustainable transport loan projects and technical assistance activities, including urban transport, public transport, climate change, and electric vehicle studies. Li Dongxiang has more than 30 years of experience in development finance, project management, regional cooperation and integration, public-private partnership, and research and knowledge management. He has developed methodologies for cross-project learning, and published prototype knowledge products. He was director of the ADB Division in the PRC Ministry of Finance, and advisor in the World Bank’s PRC Office.